Geez, it's been maybe 15 years now since I've been addicted to these cookies... My auntie in Honolulu would always get cookies for me to bring back to my family here. She wouldn't tell where she got these cookies, since she knew what I liked. It wasn't until a friend took me to Wholesale Unlimited and the first words out of my mouth, "Ahhh, this is where my auntie gets them..." I know everyone in the store heard me loud and clear. 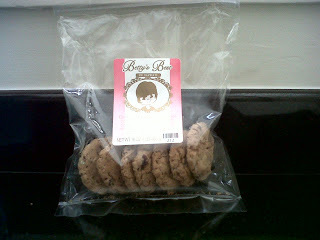 My friend Teri recently returned from Hawaii and picked up some cookies for me. I knew they'd be gone in a heartbeat, so I had to put them out of sight. I've had them for almost a week and still have half a bag, I did share some with my friend Jeff (No Twitter name yet). Monday, November 1st was Sushi Day in Japan and I was all set for a sushi lunch. Massive phone calls and project deadlines didn't allow me to leave my desk. 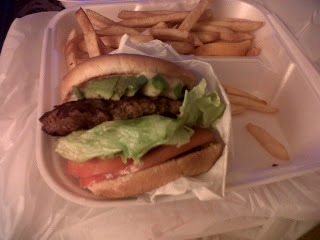 While on the phone, I happened to see a picture posted on "Burgers on the Edge" Facebook page and it looked so good... Right @jlieu? Since I was stuck on the phone, I had to scramble to get a few things done today. Now it's 3 pm and didn't have a chance to grab lunch yet. I described the awesome burger to my interim assistant and asked her to pick up lunch for me on the way back from FedEx. No burger combo for me today...She said that I would probably regret not having sushi on sushi day, since Jeff Nitta and I are launching "The LA Sushi Guys" site today. She then told me that she had no idea where to get the kind of burger that I described and didn't want to disappoint me.